Hello everyone. Today happens to be another sorta self-plugging post with the release of the 4th (FOURTH!) 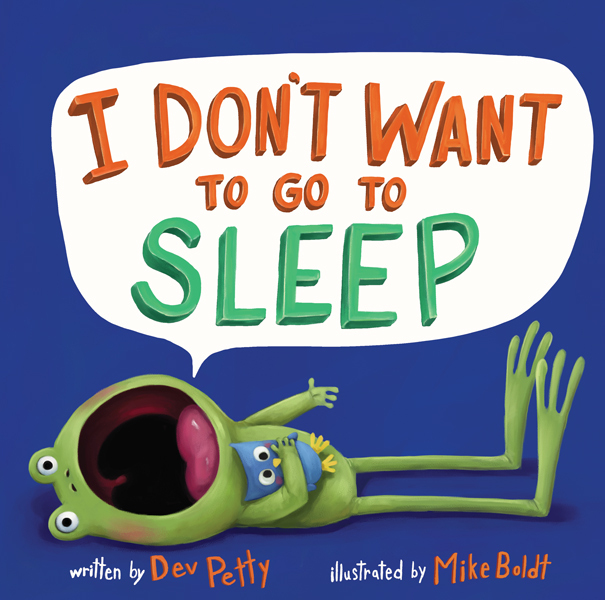 FROG book, I DON’T WANT TO GO TO SLEEP by the wonderful Dev Petty. It’s another very funny book that I’ve had the privilege to illustrate. This FROG character is one of my absolute favorites to illustrate. Dev has given FROG such an every-child-ever personality. I can hear not only my own children, but so many others as I draw his face. I can hear his voice and see his expressions just by reading the MS – something that has happened through all 4 of these books. While FROG is the standout favorite for most, I also love the supporting cast Dev has created. The “dad” frog. Rabbit. Cat. Pig. And stepping into the sounding board role for this fourth book, Owl. Owl is the character who gets to answer FROG’s questions this time. Owl first tries to correct and pass on the common knowledge that he feels FROG should have. Well, this only creates more questions which create answers FROG doesn’t exactly care for. 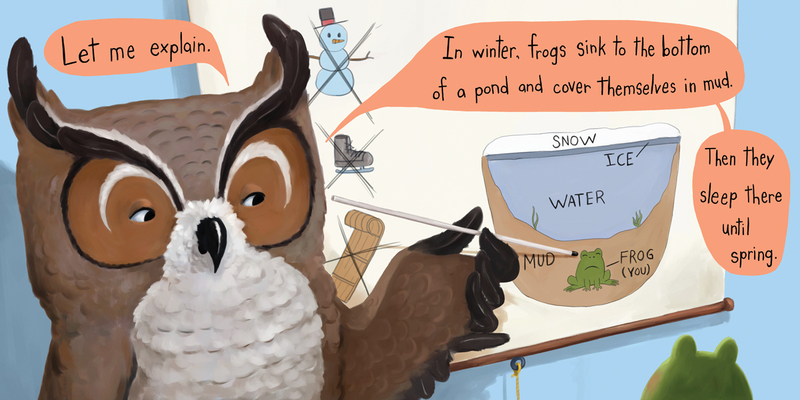 While at first Owl is rather annoyed (probably having just woken up), he really commits to teaching FROG about what he was trying to explain which ends up in one of the funniest pages in this series – which I won’t reveal here. 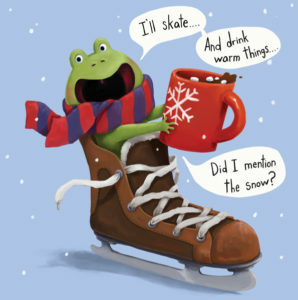 Special bonus: Frog in a skate, wearing a scarf, drinking hot cocoa (with marshmallows). To celebrate another book release, I’ll randomly select one person from the comments below to receive a signed copy of our new book I DON’T WANT TO GO TO SLEEP. I’ll announce the winner on my next blog post in early November. Good Luck! 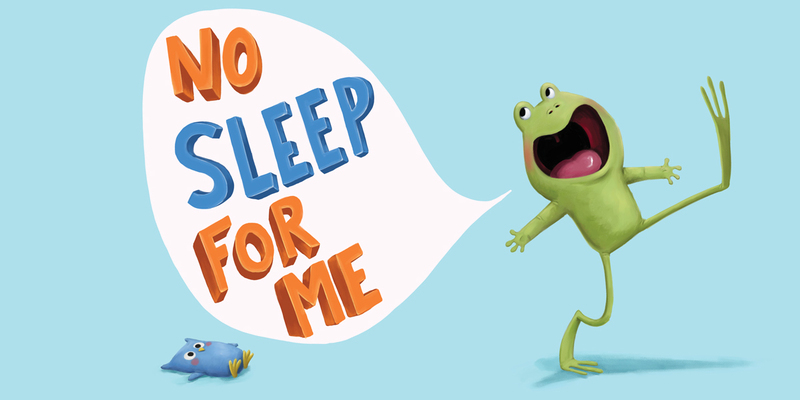 Dev Petty, Doubleday Books, I Don't Want To Be A Frog, I Don't Want to go to Sleep, Mike Boldt. Bookmark. Thanks for the great review Mike. Frog looks like he’s got another great story! The illustrations just invite the reader in. I am so in love with your illustrations! Frog is so fun and funny. Perhaps the next installment might be I Don’t Want Get Out of Bed! where Frog is a teenager…I’d love to see that too (LOL). This sounds hilarious! Congrats on another winner! Congratulations, Mike and Dev! This series is hilarious. Sounds funny and informative. Will definitely check it out as well as the other frog books. 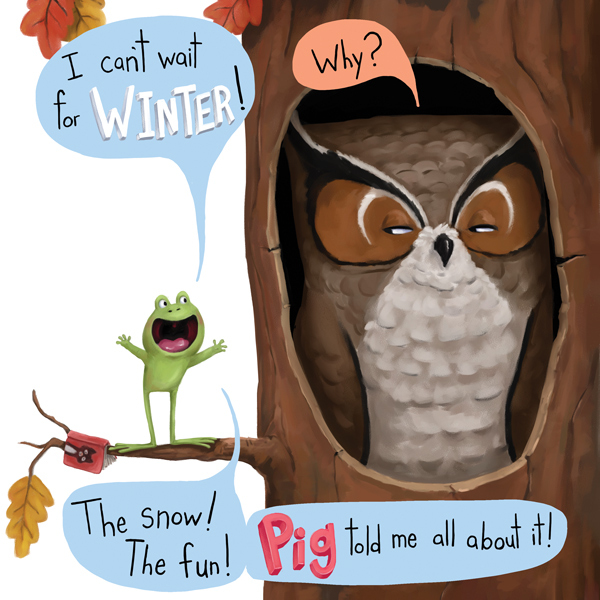 I love the idea of a kid (I mean, frog) challenging the status quo AND the wise owl, patiently explaining the way the world works! Congratulations on great illustrations! Can’t wait to get this one to read to my students! They just love this fun loving character. Your illustrations are amazing. So excited when you saw there was going to be another book. Please Create more! This looks hilarious! Thank you for the sneak peak!! Congratulations! So glad this became a series! 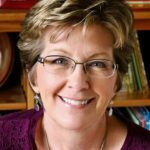 My kids and I absolutely love these books! I would love to win a copy! Thank you for sharing! This was a fun post to read. We absolutely LOVE Frog around here. Can’t wait to read this one! Thanks. I don’t think there’s anything better than the sound of a child laughing, except maybe a whole bunch of children laughing. Congrats to another giggle inducing story, Mike and Dev. Thanks for the chance to win. I love Frog! Looking forward to seeing how Owl handles all his questions . . . and already giggling. Congratulations, Mike and Dev, on a great series!!! These characters are adorable, and the text is so fun. This sounds like it will be a hit with kids…and they’ll learn something while their laughing! Love these books! Congrats to both you and Dev! Can’t wait to see Frog again. So funny! 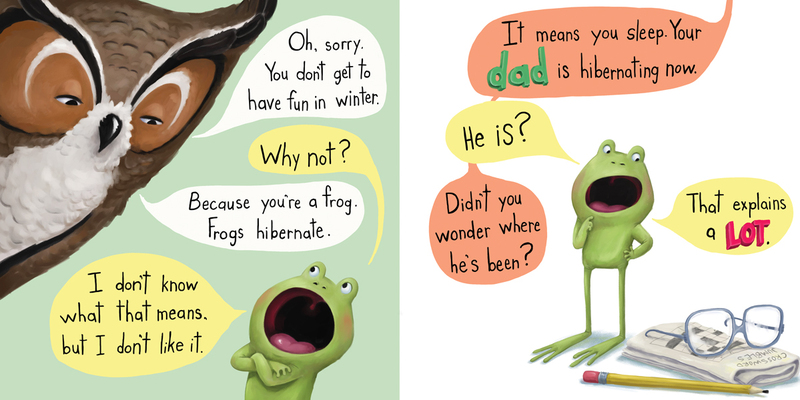 I LOL’d at the joke about dad hibernating. Can’t wait to read the whole book. Congrats to you and Dev! This character is so much fun and Mike’s art has him leaping off the pages of each story! Looking forward to reading more of his adventures! So fun! Kids will love this! Oh… please… PICK ME!!! I ADORE this frog! !😂😉 FOR REALS. You two are such an amazing team! I can’t wait to have this one too! Dev Petty’s obstinate frog books are hilarious and I’m looking forward to reading this one too. Mike Boldt’s vibrant illustrations make these books even better! 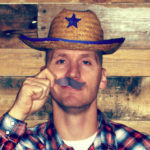 This looks like a great way to share facts–laughter and learning at the same time. And the illustrations are key to both. Thanks for sharing this. I adore these books and this one is hilarious too. I have frogs everywhere in my bathroom, bedroom, and office (my daughter tried to count them, but lost track) as they are my favorite. This book is so clever and the illustrations are fun and bright. The facial expressions/body language is my favorite part. These books are so fun! I look forward to reading the new one. Lifetime member of the FROG fan club, right here! SO funny. I love these books! Congrats to you and Dev! So fun and funny! My granddaughters would love this!! For the love of frog, I need this book!!! Wow, learning while laughing – the best combination- Congrats!! Definitely qualifies as super cute! Can’t wait to see it! This book looks like great fun! The illustrations may have something to do with that! I love, love, love this frog . . . his big mouth . . . and especially when he’s face down! HA! Such a cute book! Would love to add this to my Grandma book collection! All of the frogs in Minnesota are already fast a sleep or they better be, with temps dripping down into the 20s! Looks amazingly fun! Can’t wait! Such a fun way for kids to learn about nature! Congrats! I love this character. Glad to see more of him. Sooo funny! Congrats to Dev and Mike!!! 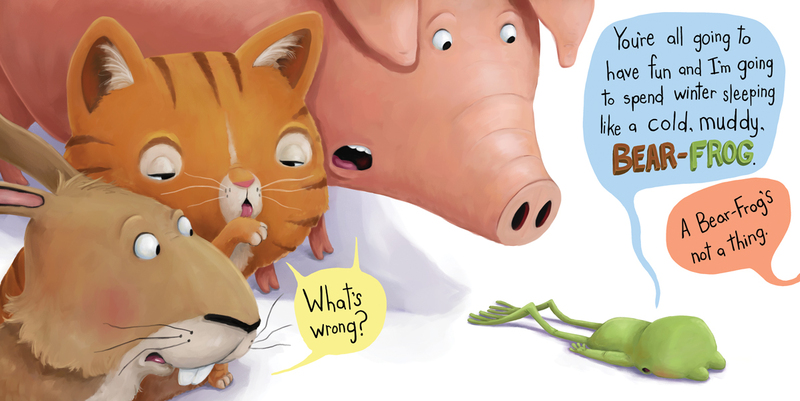 The Frog books are definitely our family favourites! So excited for the new one to come out!! I love this series, it works on so many levels! Can’t wait to read/see it! Thanks for the post and congratulations to you both! OH, can’t wait to read it! Too funny! Congratulations! The eyes of each character are so expressive – one can read volumes in those looks. That’s what makes this story so hysterical. Thank you!! Whoa, what fun!!! Can’t wait to hold a copy! Another hilarious book by the “Dynamic Duo!” Can’t wait to read this one! Congrats, Mike! I love cute funny picture books for kids! Congrats, Mike, on another great Frog book! I love your description of little Frog as “every-child-ever”, I think that captures perfectly what is so absolutely loveable about this character. Thanks for sharing! Excited to see the new book. Nothing better than a funny book that’s also informational. I, someone who’s been “around for a while”, did NOT know that frogs hibernate! I guess I never thought about it. Learning new things is always fun! Can’t wait to read its entirety.